There’s less than a week until the start of December, and exactly one month until the big day! I’ve already got my advent calendar (..a Gruffalo one), several batches of homemade mince pies are in the freezer and I’ve started to pick up a few new bits for the tree. We’re going for a neutral Christmas palette this year, with hints of red, green and gold. 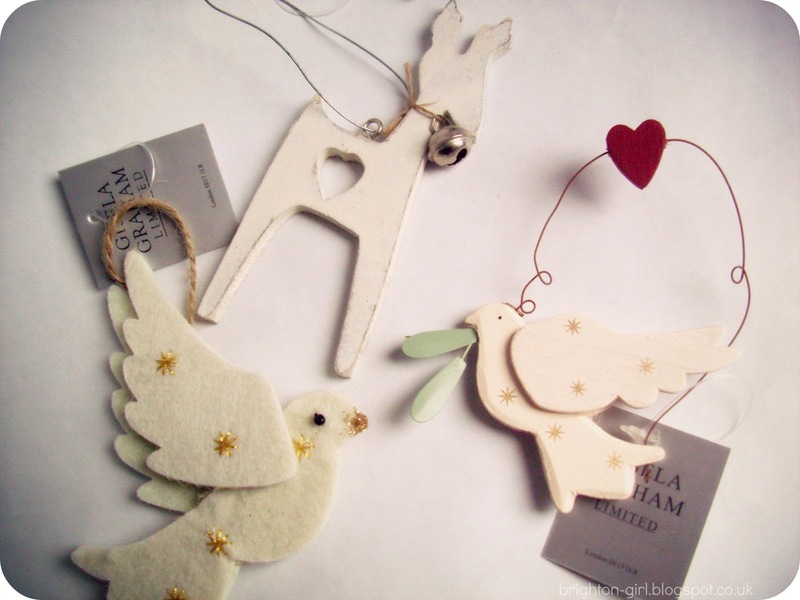 I picked up these hanging decorations in my local garden centre and they are all by Gisela Graham. I’m hoping to create that cosy cottage feel with these new decorations and I like that all of them have a homemade feel or distressed features; it all adds to the shabby chic look. I’ve got my eye on some bargain baubles in Tesco and am hoping to make both a wreath for the front door and some clay hanging decorations for the tree to complete the look. How will you be decorating for Christmas? Since we will be on student budget this year I think we're going for paper snow flakes from the least important pages of coursework. Your decorations are really cute though!! Lovely decorations, I love them! I already mooted my Christmas Tree :) You can have a look on my blog. They are so cuteee! I always have a huge mish mash of decorations every year! sorry if you have already done it! I love these decorations - they are so cute! I can't wait to start decorating! I love these traditional type of decs! Gorgeous. The deer is too cute!